Italy's Senate has passed legislation which opponents of PM Silvio Berlusconi say is designed to help him in his legal battles with the nation's courts. 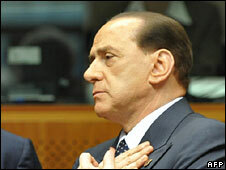 The bill would freeze some long-running trials for a year, including one involving Mr Berlusconi in Milan. And the government is set to introduce another bill that will give top public figures immunity from prosecution. The prime minister argues he has long been a victim of politically-biased judges and prosecutors. Although Mr Berlusconi was found guilty in one corruption case, the verdict was overturned on appeal and other cases were dismissed under statutes of limitation. Now he is taking strong action to try to avoid his new term of office being upset by further court appearances. On Friday, Mr Berlusconi's cabinet will table a new bill suspending any trials of the five top public office holders, including the prime minister and the president, during the period in which they serve the Italian state. A similar law passed by Mr Berlusconi five years ago was subsequently thrown out by the country's constitutional court and proceedings against him were reactivated. The decree passed by Italy's Senate, the upper house of parliament, will freeze for a year trials concerning alleged offences which carry a sentence of less than 10 years. Italy's National Magistrates' Association urged the government to abandon this measure, which it said would affect some 100,000 trials and cause chaos in the administration of justice. Mr Berlusconi's personal lawyer, a member of parliament who helped draft the new legislation, told members of the Foreign Press Association that the new measures were perfectly fair. He pointed out that those accused could ask for their trial to go ahead normally, which he said Mr Berlusconi would do in one pending case. Nonetheless, Mr Berlusconi is coming under increasing political attack for concentrating on his own personal legal problems at the beginning of his new stint as head of government, rather than on such important national issues as the future of the almost bankrupt national airline Alitalia and the Naples rubbish crisis.